Teresa Zubi has just released a free PDF book for download, with photographs and details of 25 different frogfish species found in Southeast Asia, the Maldives and Red Sea. This is a must-have book for underwater photographers, but know that even though it's a free download, you commit to talking frogfish over a cold drink if you meet Teresa on a dive trip! Who would say no to that?! Mike B: In what year did you start working on the Frogfish book? Teresa Z: The book grew out of my website about frogfishes (www.frogfish.ch). First, I wrote a small booklet just for myself and a few frogfish enthusiasts. It listed the major species found in Southeast Asia with photos and small illustrations. My friends liked the booklet and wanted more. Two of my diver friends basically sent me all their frogfish pictures and said, “Use what you need but write that book!” When added to my own pictures I now had a large stock of pictures with interesting frogfish behaviour like luring, mating, camouflage and colour change. At the same time I obtained photos of each of the 25 species I wanted to describe. So in 2010 I started out writing the book, first in German, and later translated into English. Frogfishes are notoriously difficult to identify, so my book contains a section with an identification key for frogfish species, including photos of the lure and bait and the basic colour range of the six most well known species. What makes Frogfishes so special? 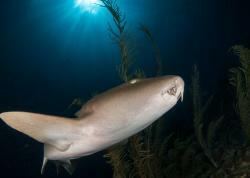 As a diver it is always a challenge to find them. Then, when I actually find them I am always impressed with their excellent camouflage. It’s well worth spending some time observing a frogfish, because it often shows really interesting behaviour – they move the lure or they slowly position themselves over a hole in the sand or a crevice where fish like to swim into. Sometimes they yawn and if you are lucky you might even see them catching their prey or mating. Where is the best place you have dived to find Frogfishes? Indonesia, the Philippines and Borneo are definitely the best places! My all time favourite dive area is still Lembeh Strait in Northern Sulawesi. This is also the place where back in 1994 I saw my first frogfish, perching on the superstructure of the Malawi wreck in the middle of the strait. Frogfishes are often found on sand and rubble or perching on sponges, but not so often on coral reefs with hard corals. Once you find one in a certain place you have a good chance to find it there again on a later dive. 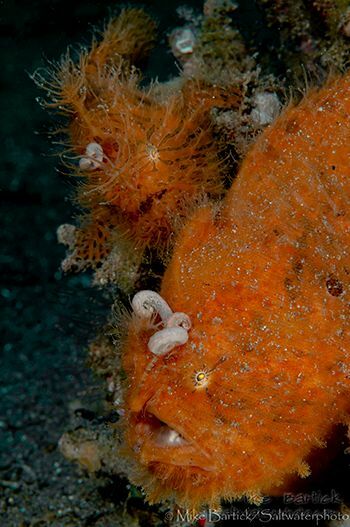 Do you have a favorite Frogfish? I think that would be the Warty frogfish (A. maculatus) because of its cute face, incredibly good camouflage and interesting colours, or the Hairy frogfish (A. striatus) because of the way it walks around and flips his lure like a fat worm over its head. You find a good example of this behaviour in my book. Why did you decide to release the book on the internet, free of charge? Like any writer I would have liked to have my frogfish book printed, but I couldn’t find a publisher. I was really frustrated for a while and put the book aside for two years. My friends had been nagging me a lot during that time and tried to find publishing solutions (some very elaborate ideas, including printing it in Kota Kinabalu, Borneo, then shipping to Switzerland, then sending it from there to the buyers around the world – really easy!). No – though I have thought of putting together a frogfish book with species from Australia or one with species from the Caribbean. My name is Teresa Zuberbühler, but everybody in Switzerland calls me Zubi. I am a teacher and manage a day care center for primary school kids and children with special needs. I have always travelled a lot and am interested in foreign cultures and languages and whenever I have holidays I fly to Asia (mostly to Indonesia, the Philippines and Malaysia). My passion for the last 20 years is diving and photography. In 1999 I started a website about diving in Southeast Asia (www.starfish.ch) with lots of maps and descriptions of dive sites. My website also has a huge collection of images of fishes and invertebrates and you can mail me for tips about how to identify the different critters. 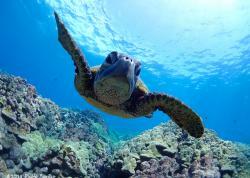 Visit Bluewater Photo & Video for all your underwater photog and video gear. Click, or call the team at (310) 633-5052 for expert advice!